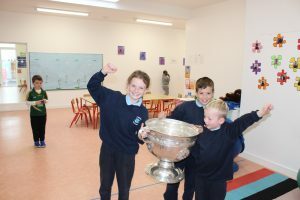 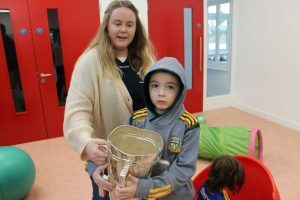 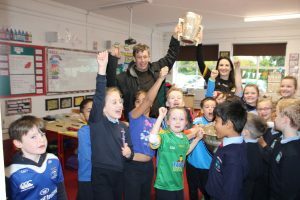 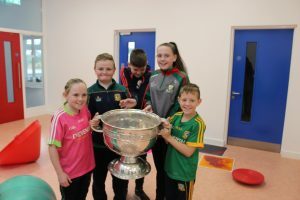 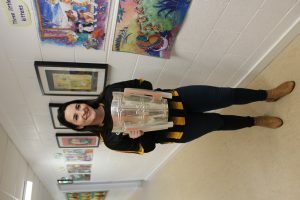 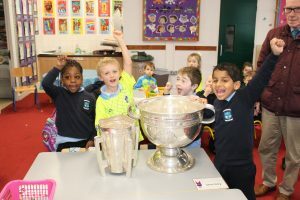 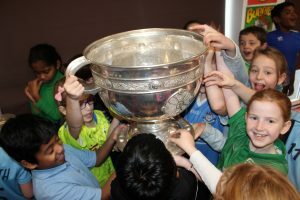 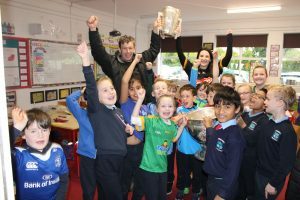 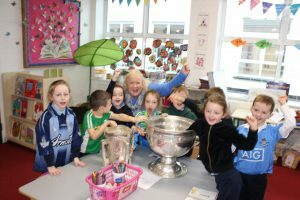 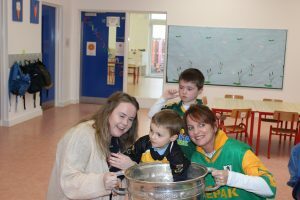 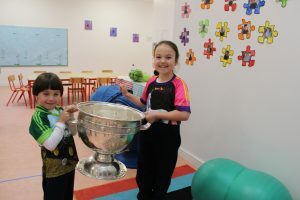 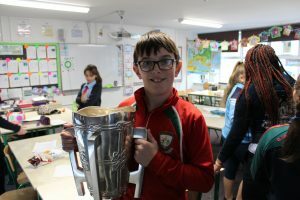 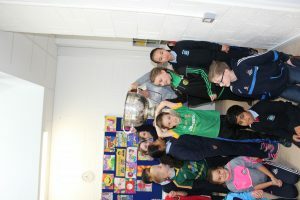 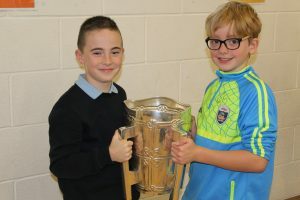 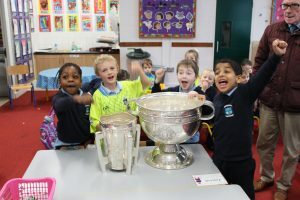 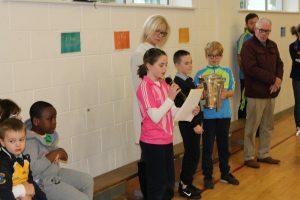 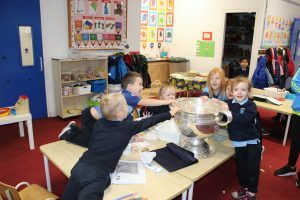 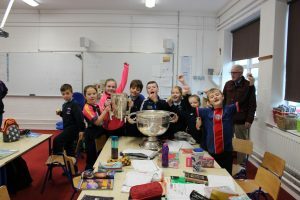 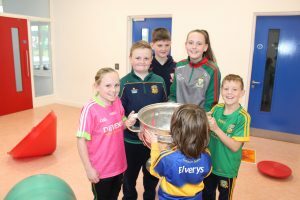 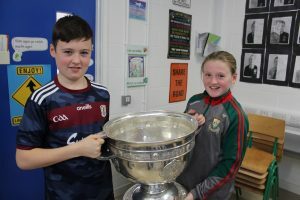 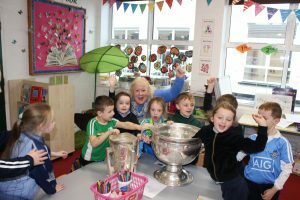 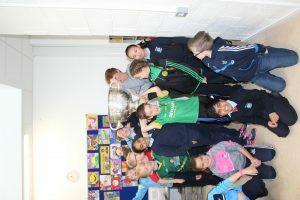 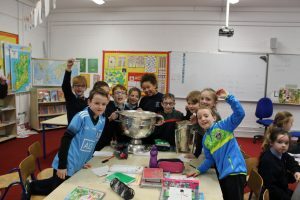 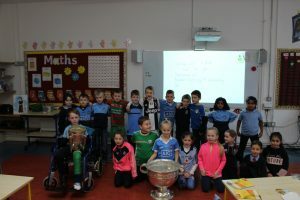 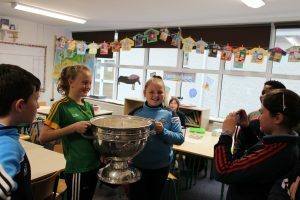 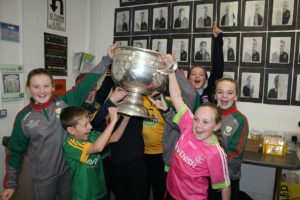 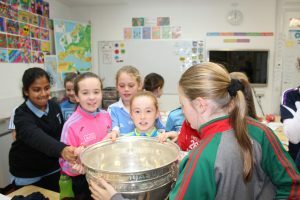 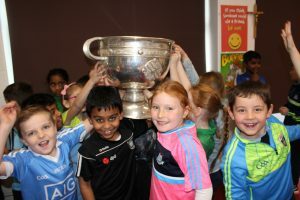 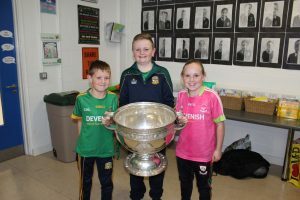 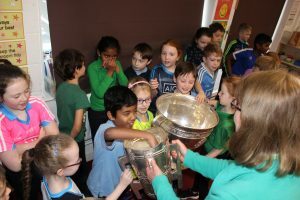 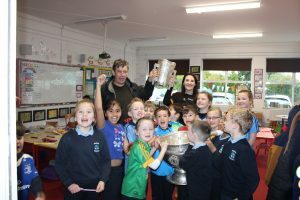 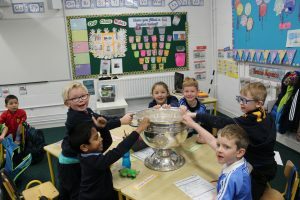 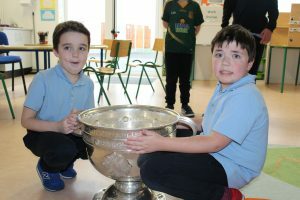 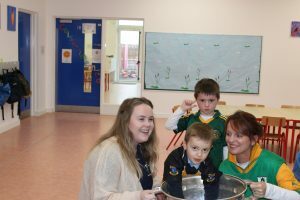 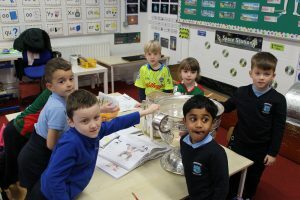 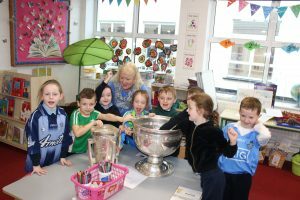 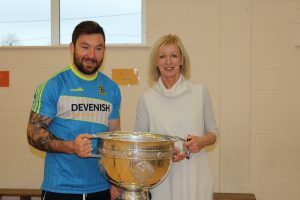 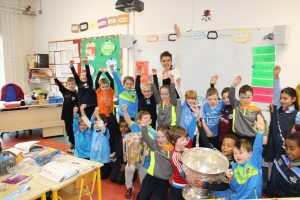 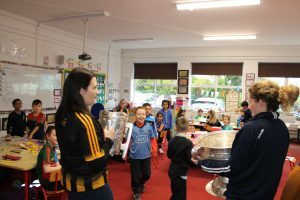 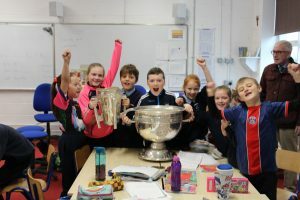 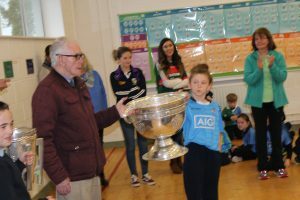 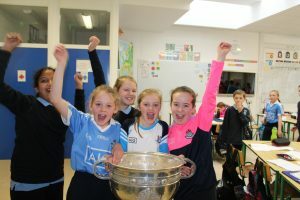 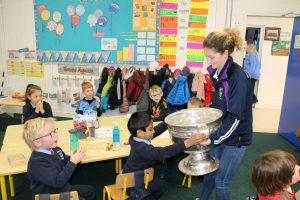 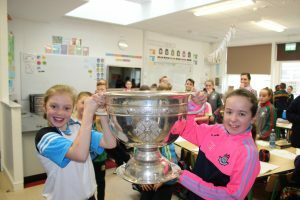 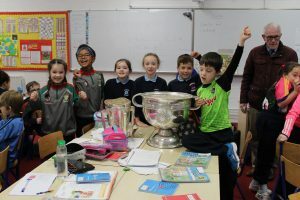 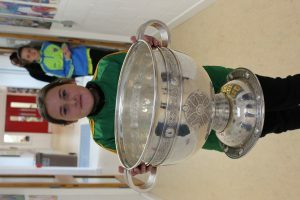 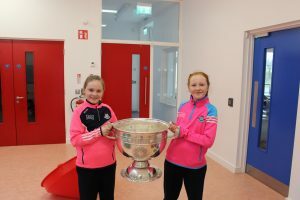 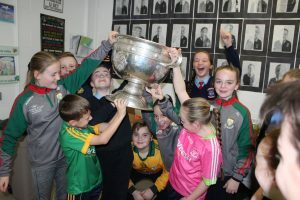 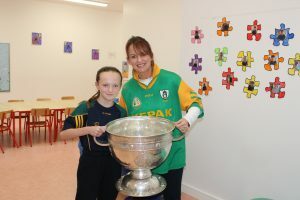 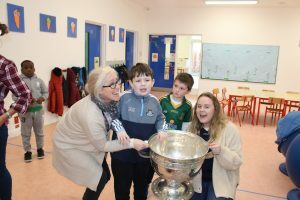 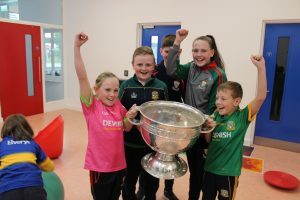 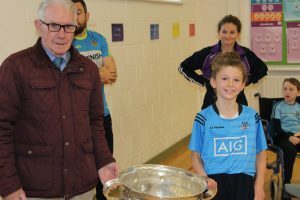 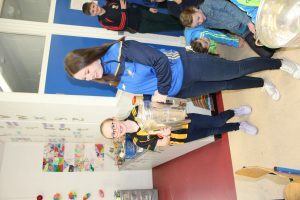 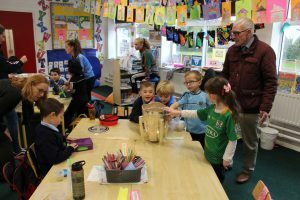 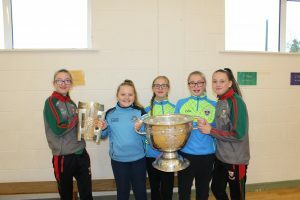 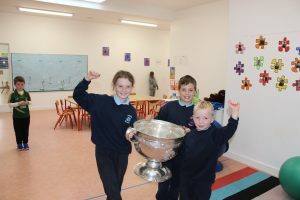 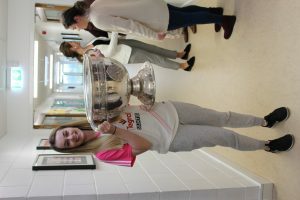 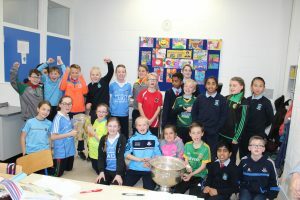 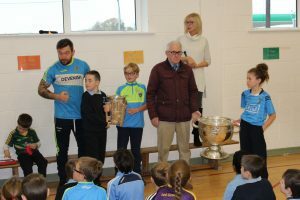 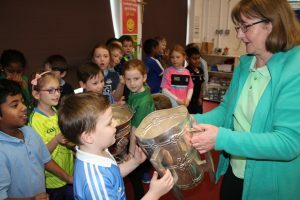 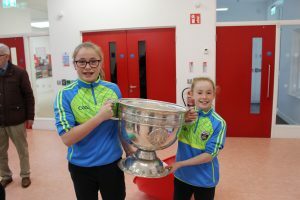 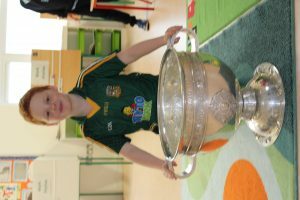 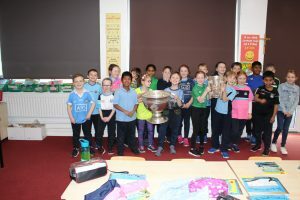 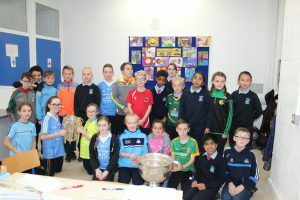 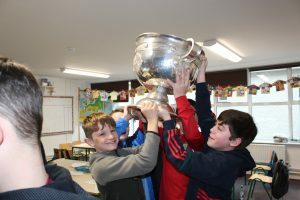 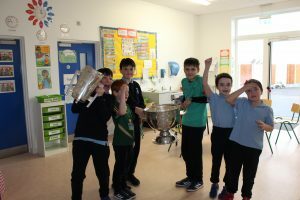 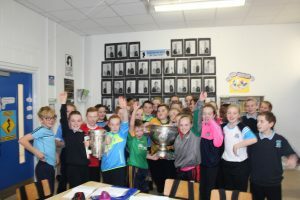 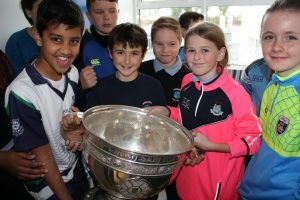 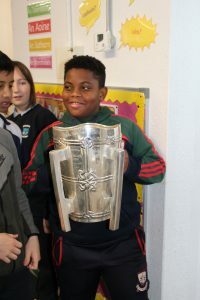 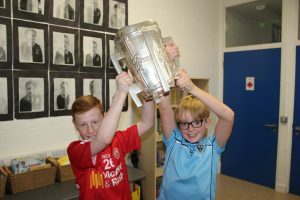 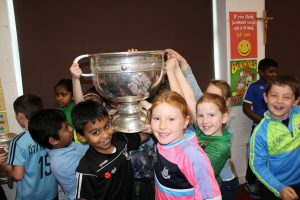 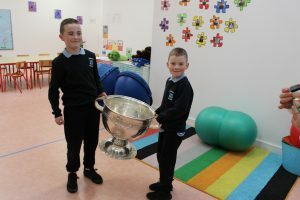 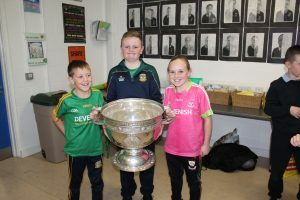 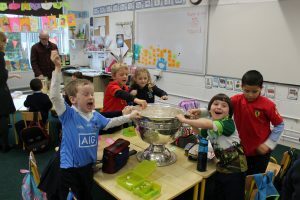 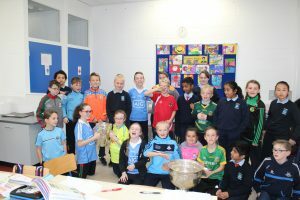 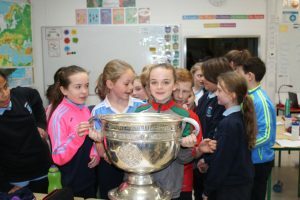 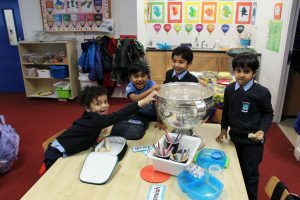 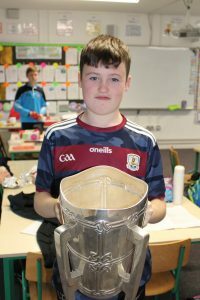 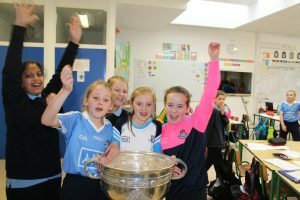 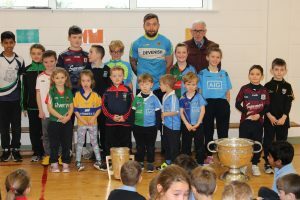 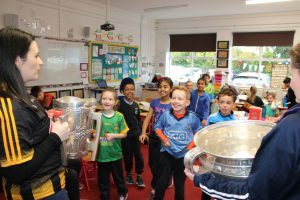 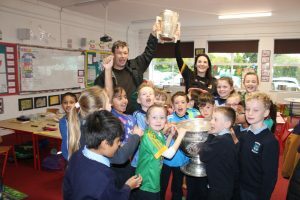 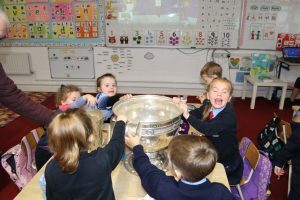 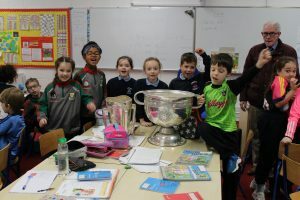 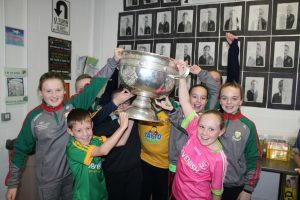 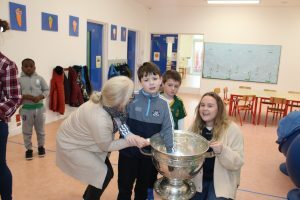 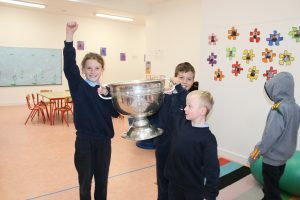 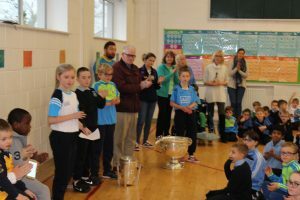 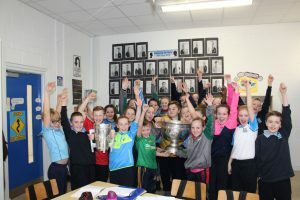 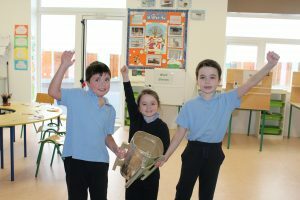 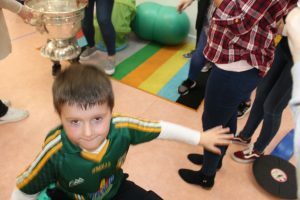 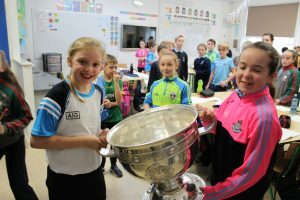 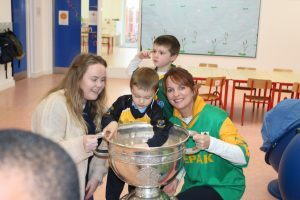 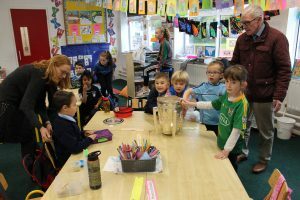 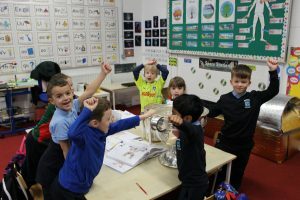 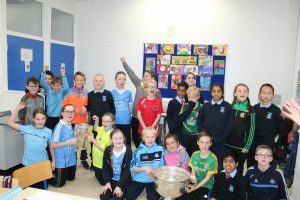 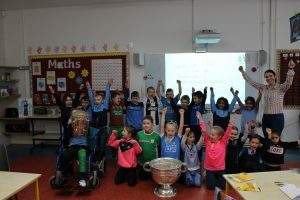 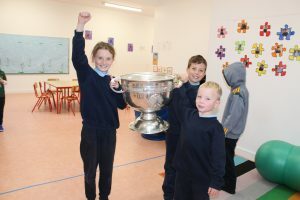 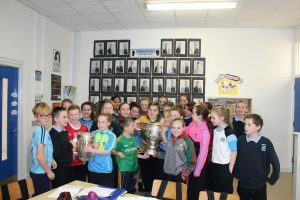 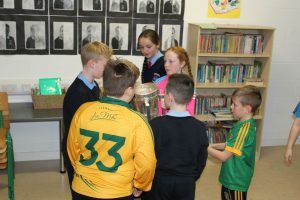 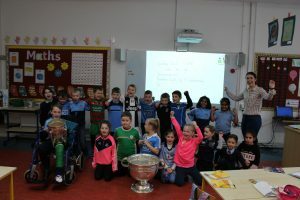 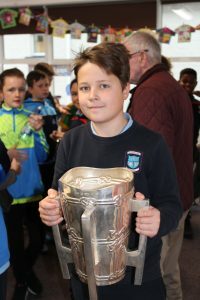 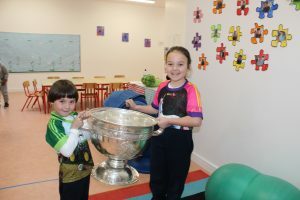 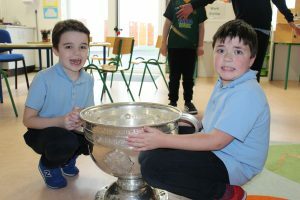 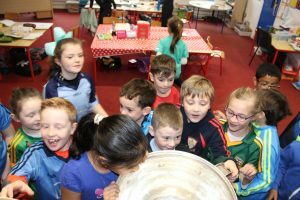 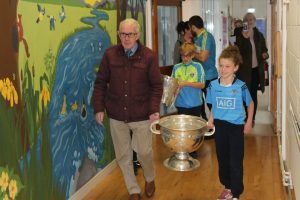 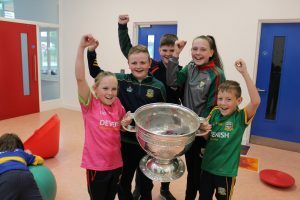 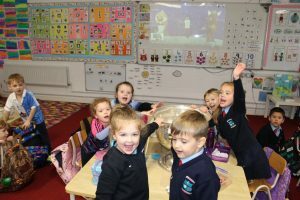 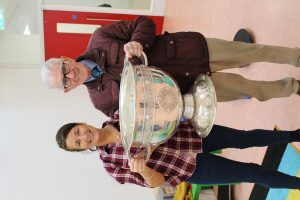 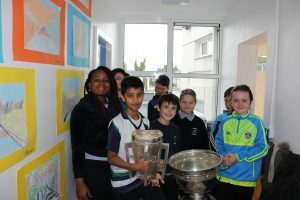 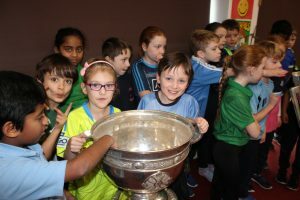 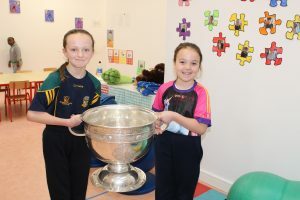 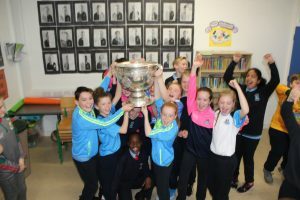 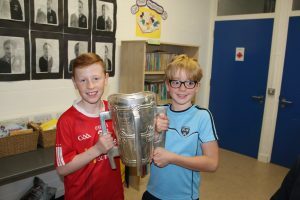 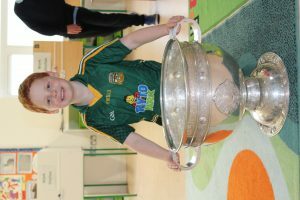 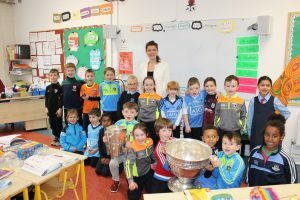 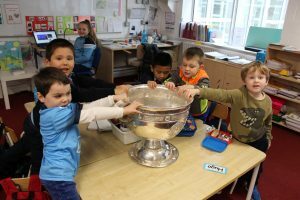 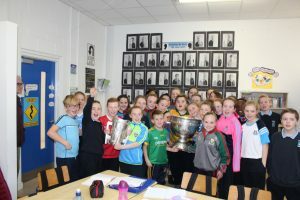 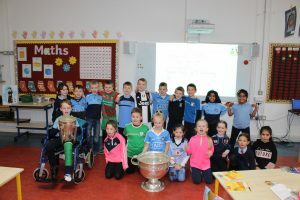 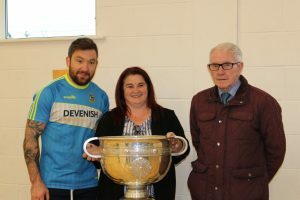 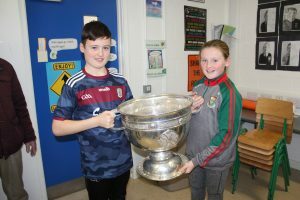 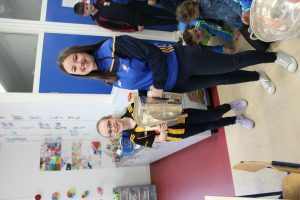 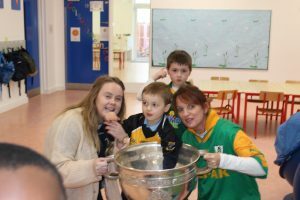 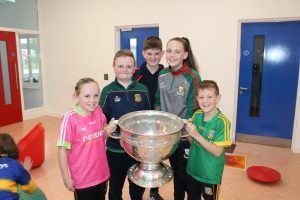 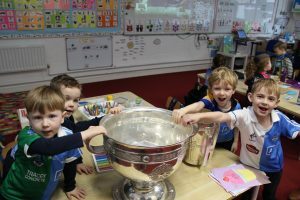 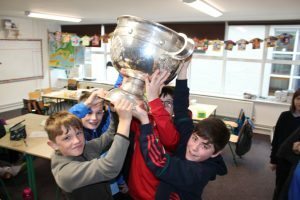 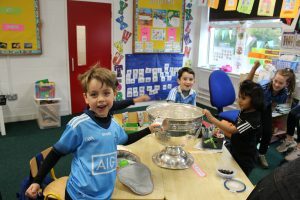 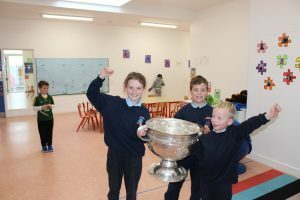 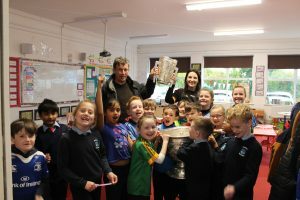 Wednesday 21st November was a momentous occasion for Scoil Bhríde when the Liam McCarthy and Sam Maguire Cups came to visit! 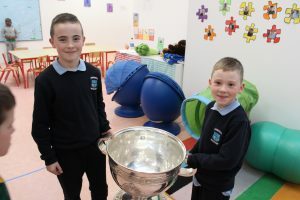 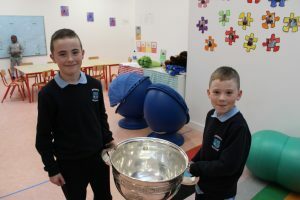 Our current 5th class had won a competition in Croke Park and their prize included, seeing these two famous trophies and a visit from Meath player Mickey Burke. 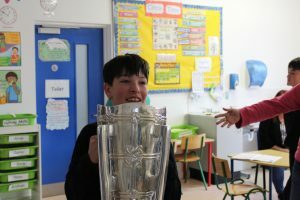 During the special assembly Liam and Sam received a warm welcome from many excited fans! 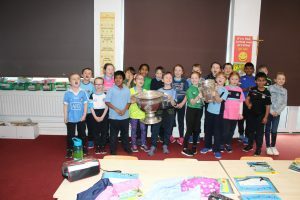 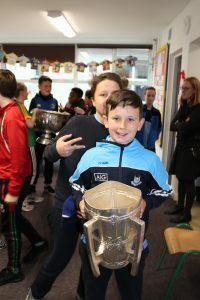 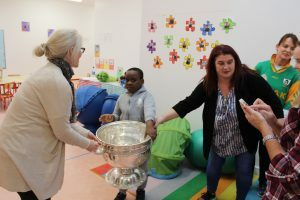 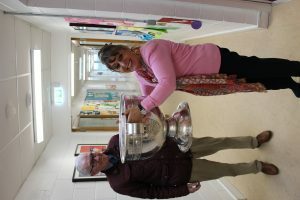 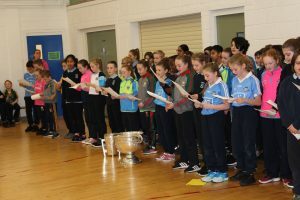 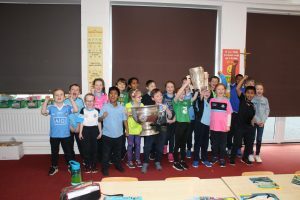 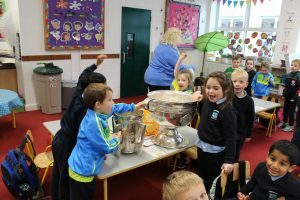 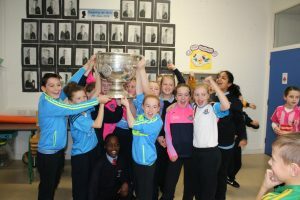 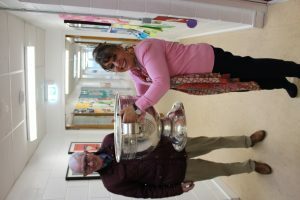 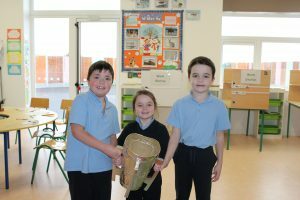 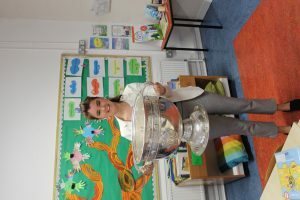 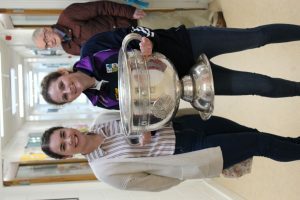 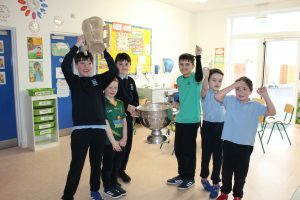 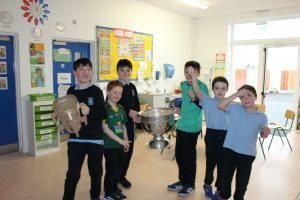 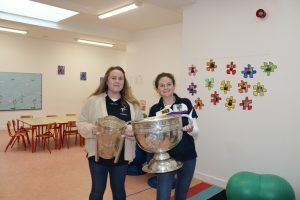 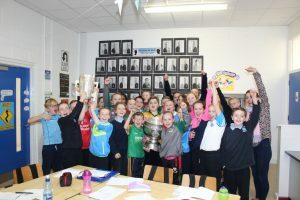 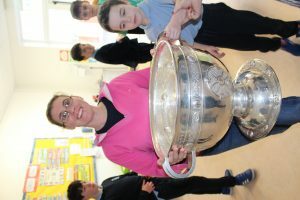 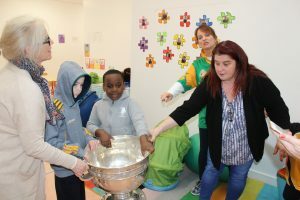 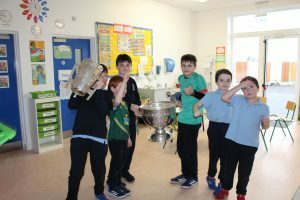 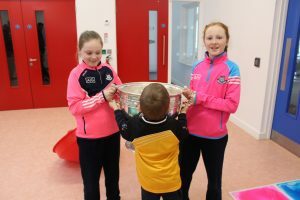 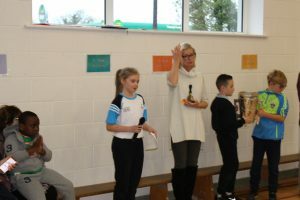 5th class kindly shared their knowledge on the two cups and the people behind them and 5th and 6th class sang Amhrán na bhFiann for the whole school. 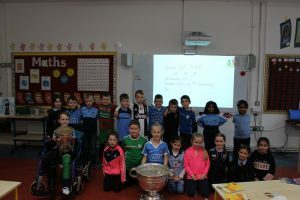 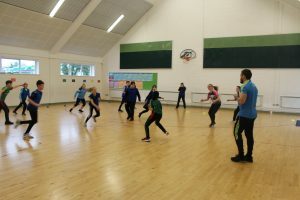 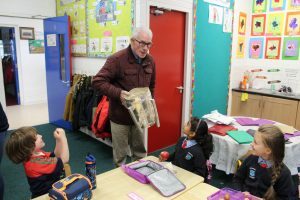 Both classes were also lucky enough to have a quick training session with Mickey, which they really enjoyed. 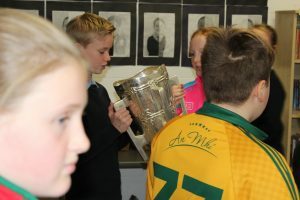 Mickey gave some great tips to the students encouraging them to always try their best and to work hard in any sport or hobby they take part in. 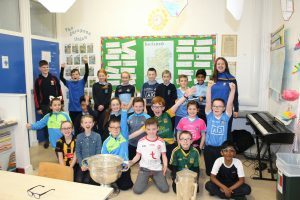 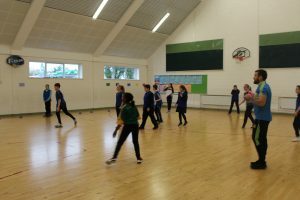 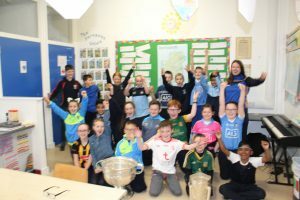 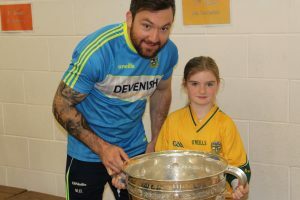 While the current champions Dublin were strongly represented around the school, there were plenty of Meath jerseys to be seen. 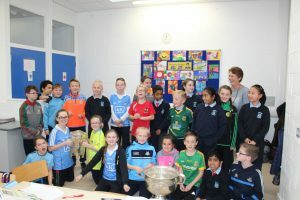 It was also great to see so many different jerseys represented on the day. 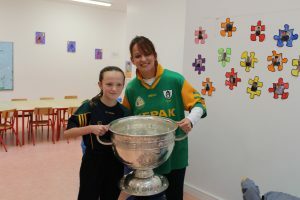 A fusion of colours from Limerick, Tyrone, Kildare, Kilkenny, Wexford and many more spread throughout the hall. 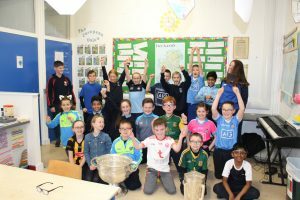 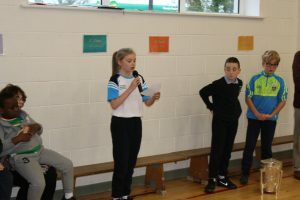 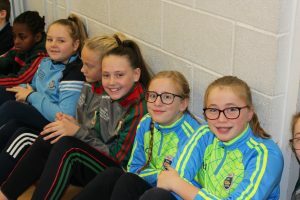 We also had a variety of club jerseys making an appearance such as Dunboyne, Tyrrelstown and Erins Isle and children from these clubs spoke about their teams. 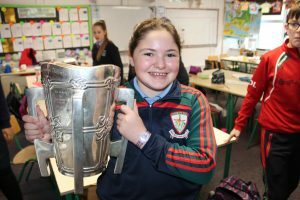 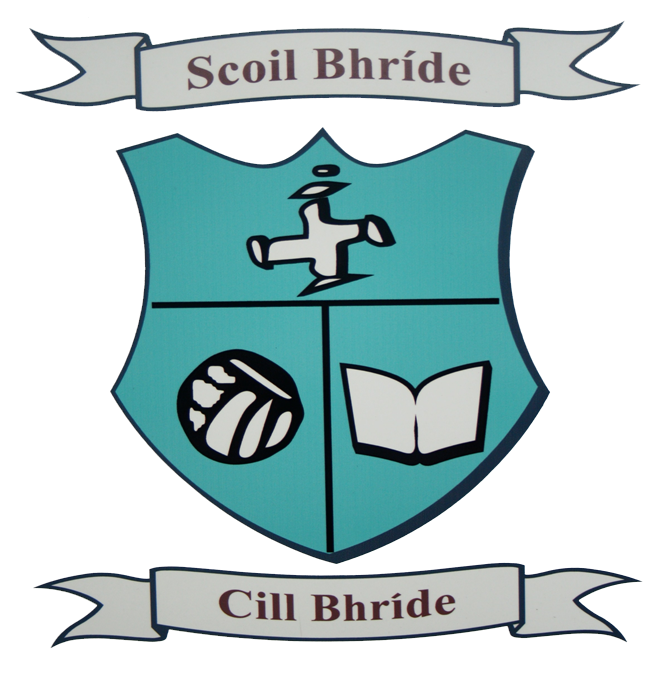 We are lucky in Scoil Bhríde to have such a variety of talent in the area. 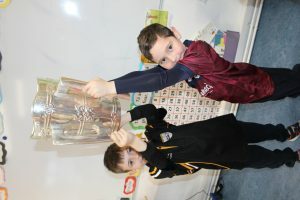 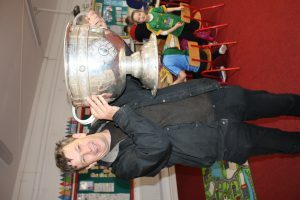 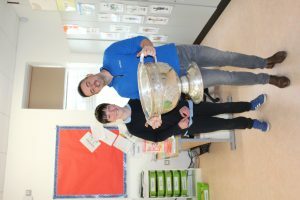 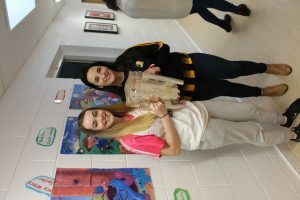 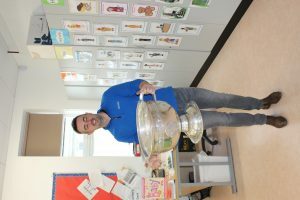 The two cups were brought around to each class with the help of Tommy Mahon and Art. 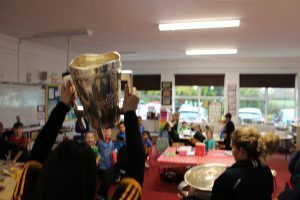 We think the pictures speak for themselves in showing how much enjoyment was had around the school on the day. 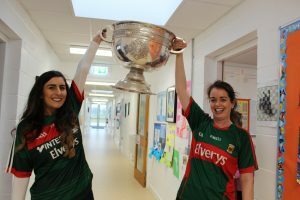 Míle Buíochas for your support on Jersey Day!